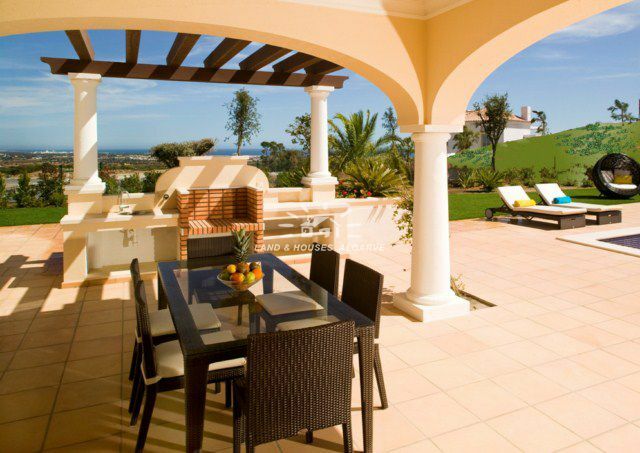 The Village of O Miradouro is set in the heart of Monte Rei Golf e Country Club and will comprise 90 luxury homes. There is a Clubhouse with health club, a nearby shopping mall with elegant shops and a variety of restaurants, from formal to very relaxed. The density of property in the Village is remarkably low, with only 90 homes being built on an area of 34 acres. It is believed that this low density upmarket development is designed to set new standards of comfort and elegance, which few resorts in the world will ever match. Occupying over 1000 acres of idyllic countryside in the Algarve, this exclusive development will feature two champion ship golf courses, five lakes and a magnificent golf clubhouse offering unparalleled levels of style and comfort. Property owners will naturally have the option to buy golf membership, which can be passed on with the property. There are three model villas to choose from. The prices vary between Euro 1.715.000 and Euro 1.920.000. Plot sizes vary between 980m2 and 1.295 m2. Distances: Faro: 48 km; Tavira: 18 km; Spain: 30 km. Please ask us for more details, floorplans etc. of this beautiful, new built villa with high quality finishings throughout and a total of 4 bedrooms, 5 bathrooms, living room, dining room, a fully fitted and equipped kitchen, large terraces, garage, swimming pool and much more.